Bringing visual thinking into your meetings - ThoughtForm, Inc.
For most of us, meetings are part of our everyday work life. Companies and teams of all sizes and industries have all kinds of meetings, for all kinds of reasons. There are the daily standups that keep teams focused and connected, and the quarterly staff meetings that build corporate alignment. Although they vary in scale, both of these types of meetings are focused on information sharing and report-outs. Then there are the critical meetings that bring groups together to develop ideas, solve problems, and make decisions. These types of meetings tend to be longer, have more participants, and have higher stakes. When a meeting is good, it’s really good. The meeting leaves participants feeling energized and inspired. It unites teams around a common goal and purpose. Often, the meeting results in more productivity in an hour, a day, or a week than the team would’ve had in twice that amount of time on their own. And when a meeting is bad, it’s really bad. The meeting leaves participants feeling drained and bored and wondering what they were just subjected to. It creates confusion, frustration, and division. And unfortunately, it often brings productivity to a grinding halt. All good advice, and all suggestions that ThoughtForm endorses. But if you’ve ever attended a meeting at our office, you know that we like to take things a bit further. Whether we’re hosting a client for a workshop or gathering as an internal team to brainstorm approaches, we leverage visual thinking to make the most of our time together. Without a doubt, it makes our meetings more effective and efficient. Participants are more deeply engaged in the conversation, which allows them to build understanding quickly. They feel inspired to get together, get creative, and get things done. So how do we do it? 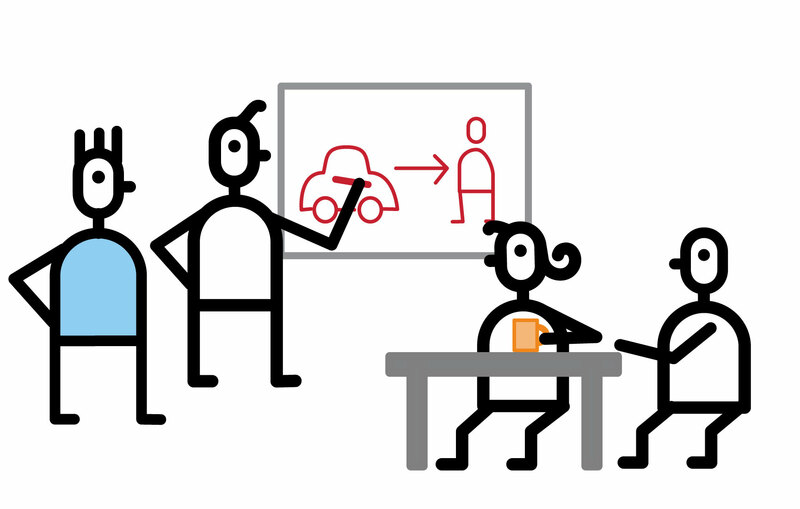 Read on for four ways to elevate your next meeting through visual thinking. 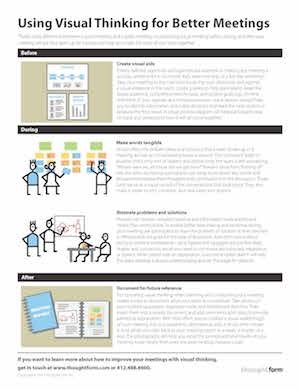 Run better meetings with visual thinking.